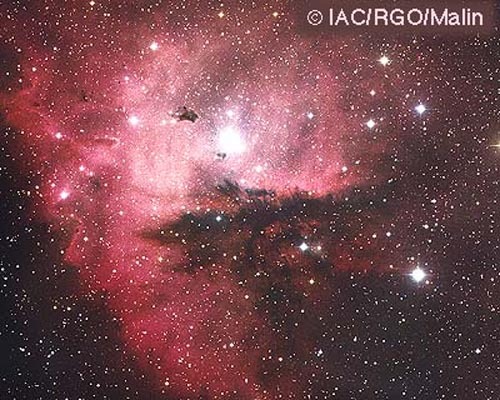 Explanation: NGC 281 is a busy workshop of star formation. Prominent features include a small open cluster of stars, a diffuse red-glowing emission nebula, large lanes of obscuring gas and dust, and dense knots of dust and gas in which stars may still be forming. The open cluster of stars IC 1590 visible on the upper right has formed only in the last few million years. The brightest member of this cluster is actually a multiple-star system shining light that helps ionize the nebula's gas, causing the red glow visible throughout. The lanes of dust on the lower right might be the home of future star formation. Particularly striking in the above photograph are the dark Bok globules visible against the bright nebula. Stars are probably forming there right now. The entire NGC 281 system lies about 10 thousand light years distant.